2018 EC-EOC recipients and mentors. 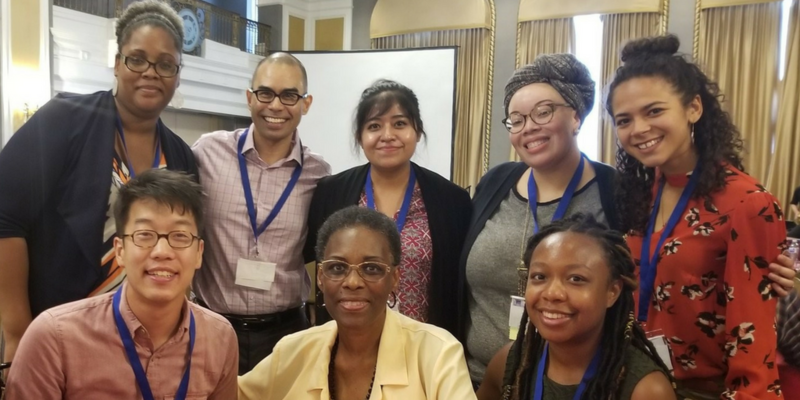 Pictured from top left: Janelle Jennings-Alexander, Jeffrey Cabusao (Program Mentor), America Moreno Jimenez, Erin L. Berry-McCrea, Kia Turner, Andy Chen, Anna J. Roseboro (Program Mentor), and Sarah Cole. The specific purpose of this award is to support early career teachers of color as they build accomplished teaching careers in literacy education. Practicing preK to university-level literacy educators of color who are in the first five years of a paid teaching career and who aspire to build a career in literacy education. People of color refers to historically underrepresented groups: African American, American Indian, Asian American, Latinx, and Pacific Islander. Programmatic: (1) two years of support from a mentor in year one who can help the scholarship recipient plan his or her institute experience and to use NCTE resources to enhance professional growth; (2) in year two, the opportunity to present or co-present at the NCTE Annual Convention; (3) an opportunity to collaborate with NCTE leaders; (4) a plaque to recognize the recipient’s participation. Financial: round-trip airfare, hotel, and meals for the summer EC-EOC Institute in year one AND round-trip airfare, complimentary registration at the NCTE Annual Convention, three nights lodging expenses, and a $50 per diem for three days at the NCTE Annual Convention in year two. Note: The July 2019 EC-EOC Institute site will be held in Washington, DC, and the 2020 NCTE Annual Convention is in Denver, CO.
A complete application will include a recommendation letter and a signed support letter from your school administrator or university-level supervisor. All award recipients must be an NCTE member at the time the award is accepted. The annual membership cost is $50.00 and recipients can join online. Deadline: The 2019 application deadline is Tuesday, April 30, 2019, at 11:59 p.m. CDT.